This is what a carnival is all about. The king of Carnivals, the Carnival of Venice, needs no introduction. The world's largest and most famous masked ball has existed since the Middle Ages. Two weeks of street partying alongside actors wearing harlequin outfits and carnival masks. The party starts up every day in the early morning with live music and acting displays, and continues well into every evening. There is everything to see here including jugglers and fire-eaters and the costumes are truly remarkable. Venue: St Mark's Square and other venues. La Biennale, founded in 1895, is one of the most prestigious cultural institutions in the world. The art biennale features hundreds of international artists showing their work in the country pavilions of the Giardini (gardens in the eastern part of Venice), in a former naval shipyard nearby called the Arsenale and in numerous historic palaces, churches and museums scattered about the city and on the surrounding islands. Many of the offsite exhibitions are free. The Festa della Sensa, is one of the city's best known festivals that bring to life the close bond that the city shares with the sea. There is special focus on the art of rowing "Voga alla Veneta", with a water parade of traditional rowing boats from San Marco to the Lido, lead by the Mayor of Venice and other dignitaries. Venue: From San Marco to the Lido. Dating back to 1577, Venetians have celebrated their deliverance from a terrible plague and the construction of Palladio's 'Rendentore' (Redeemer) Church, commissioned for the same reason, with a pontoon of boats, fireworks display and picnics on the water. The internationally acclaimed film festival is every September on the Lido and sees famous personalities and stars descend upon the area to enjoy the recognition of their craft. The Lido becomes busy through this week, and offshoot events often spring up. Some films are industry only but others are open to the public. Venue: Palazzo del Cinema, Lido. 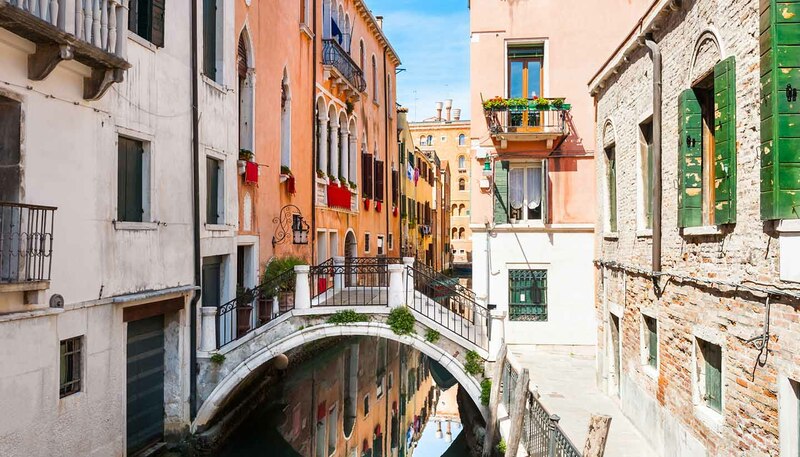 International and Italian musicians perform in venues throughout the city, including in Piazza San Marco, Teatro La Fenice, Peggy Guggenheim Collection and Palazzo Grassi. Past guests have included big names like Sting, Cesaria Evora and Gilberto Gil. For a city that has more waterways than main roads, this spectacular marathon is now in its 32nd year. The race takes place on the fourth Sunday in October starting in Sta, a small country town and finishing in the centre of Venice. A maximum prize of 10,000 Euros is in place for the winner of individual categories. Side events include a family fun run and a pasta party. This festival is one of the most religious in Venice and one of the least tourist driven affairs. In 1630 the Plague took its hold on Venice, for the second time in fifty years. The Doge called upon the Virgin Mary to rid them of the curse, and a pilgrimage to her church took place by all those residents of Venice who were able to make the journey. These days, patrons still attend her church to ask for good health. Venue: Church of Santa Maria della Salute. The first Venice architecture biennale opened in 1980. Now in its 13th year, the exhibition is also held in two venues – the Giardini and the Arsenale. This year's exhibition, entitled Common Ground, showcases the best in world architecture and has been organised by the British architect David Chipperfield. Highlights include contributions from big names like Zaha Hadid, Norman Foster and Rem Koolhaas, as well as plenty of fascinating exhibits from lesser-known architects.